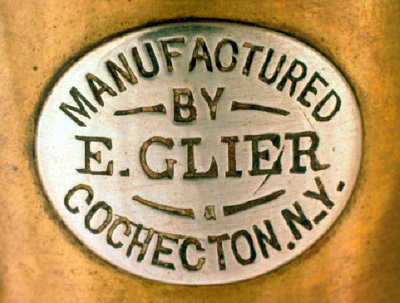 MANUFACTURED / BY / E. GLIER / COCHECTON. N.Y.
Ernst Ferdinand Glier was trained by his father, Christian Ferdinand, who immigrated to upstate New York from Markneukirchen in 1856. This cornet reflects an American, rather than a German style, however, and features the flat Allen valve, a type of string-operated rotary valve. 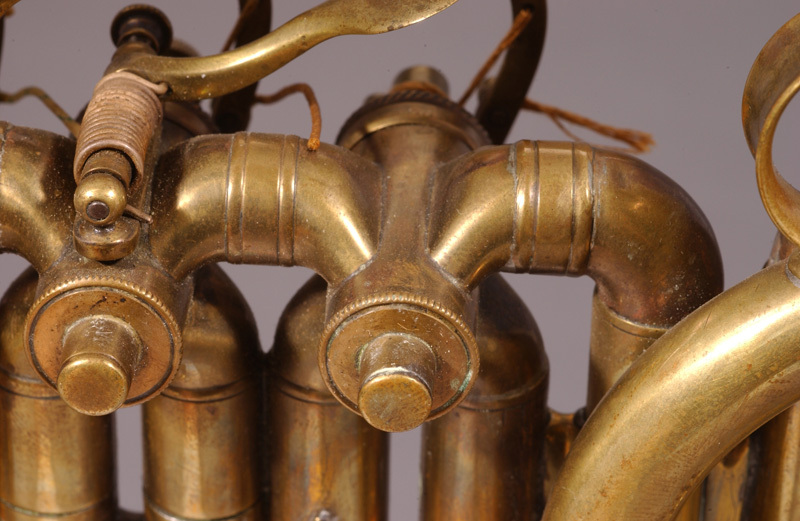 The completely circular body shape, occasionally found on mid-nineteenth-century American cornets, was achieved on this instrument by the use of a non-functional "dummy tube." 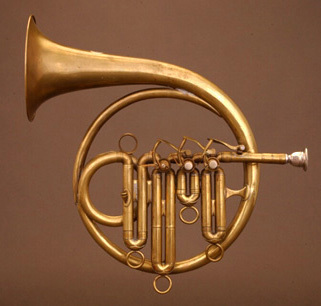 Similar circular cornets were offered by E. G. Wright and Isaac Fiske. 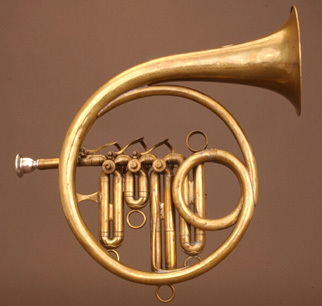 Body: Brass with double-looped tubing: leadpipe; valve segment; main tuning slide; conical, coiled bellpipe; French rim. Valves: Three top-action, string-operated rotary valves. Spiral-spring return mechanisms; reciprocal driver pivot with stopping buffers positioned inside the rotor. Internal slide tubing. Windway: first, second, third valve. Click on image above to see a larger image of the flat Allen valves. Accessories: German-silver cornet mouthpiece contemporary to instrument. Sounding length: 1279 mm; internal diameter, leadpipe: 10.3 mm; bore diameter (inner valve slides) 10.9 mm; bell diameter: 106 mm. Literature: Clint Spell, "Circular Cornet in B-flat by Ernst Ferdinand Glier (1827-1870), Cochecton, New York, ca. 1860" in "Historical Instrument Window," Sabine K. Klaus, editor, International Trumpet Guild Journal, Vol. 32, No. 2 (January 2008), p. 47. Robert E. Eliason, "D. C. Hall and the Quinby Brothers, Boston Music Industry Leaders: Makers of Brass Instruments with Flat, Round, Square, and Piston Valves," Journal of the American Musical Instrument Society, 34 (2008), p. 92.